The weather has been magnificent, temperatures in the high 70’s and some days, like yesterday, in the high 80’s. If you are like me you are still enjoying these last days of “summer.” On the weekends, I eat breakfast poolside, umbrellas in the up position. In fact, headed to the beach today, I can never turn up an opportunity to sit by the ocean, with my feet in the sand, listening to the gentle roll of the waves. This is Paradise. I will bring books, and a sketch pad to capture a design, never leave home without a sketch pad or at the very least paper and pencil. Last weekend I was an exhibitor at the juried Nassau Museum Art Show on Long Island, Roslyn, NY. The weather was much like it is right now, magnificent. I was exhibiting my metal work, I met some wonderful artists and buyers. The New York crowd is wonderfully embracing, they have a true appreciation of the arts and I love meeting them and selling my work to them. 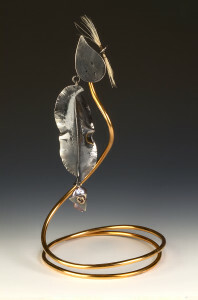 October 18 – 20 I will be exhibiting at the Academy Art Museum South Street Easton, MD, 65 juried artists. I will be a first time exhibitor at this show, expecting exciting things from a show that has taken the manual labor out of set up by supplying pipe and drape, tables and chairs and has a porter at your disposal. If you are in the area, please stop by and support the Academy Art Museum and the very talented artists exhibiting. I have included a one-of-a-kind piece, Portrait of Love, sterling silver, baroque pearl, boar’s hair, bronze stand. The piece is wearable and when not worn is a sculpture. Being immersed in all this creativity and surrounded by such talented artists has pushed me to create a new technique for color on my clothing designs. I have been experimenting with paint on my sun protection fabric to add artistic dimension to the designs and I have come up with a process that I am excited about. Look for these new designs for the 2014 Art Collection to be titled; Beach Shack Designs. As always be sun safe and plan your full body check this fall, this is a great time to plan this after spending a summer in the sun. Take your family, tell a friend…could save a life!